When I first came here, I couldn't stand up by myself. I couldn't walk. I am most proud of my new-found self-esteem, will-power, and discipline that I didn't have before. I want to thank the therapists and nurses who kept me going strong. Y'all have done nothing but great things for me. Because of y'all, I can do things I never thought I'd do again. Shelia has been on a long journey to this moment. She had been hospitalized and had been placed on life support. After recovering, she joined our community at Signature HealthCARE of Monteagle. 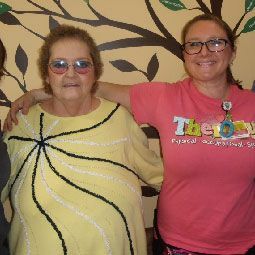 After months of therapy services, including physical, occupational, and speech language therapy, Shelia has made big strides. She is now walking independently and is feeling confident and proud of her progress.